Another stamp in the same set as the previous post, ‘save energy’. When this stamp was issued, energy recycling did not yet mean ‘renewable’ in Japan, where the mainstream of energy discussion was around building more and more nuclear power plants. Now, after the tsunami has made the cooling system of the Fukushima power plant disabled, people started to discuss the dangers of having 54 nuclear power plants on the edge of tectonics – and the 300 year long problem of how to keep nuclear waste safe. I am shocked myself how I did not pay attention to the decommissioning of nuclear power plants, until this large scale distruction. This is going to be a problem all over the world – 531 existing and under construction plus on-going plans of nuclear power plants, if the buildings are not standing there for ever. It is not well broadcast abroad that in most of Tokyo people are having planned power cuts, up to 3.5 hours a day. Many shops are open with reduced illumination, as well as in stations. They must have a difficult time, even if they expect the black out they have to build their life around it. But there are some positive comments on their situation – one found that the stars are so beautiful when the street lamps are out, another thought a restaurant was nice and intimate with a table lamp. I thought I could find several stamps about Energy Saving, but found only a set of two, which were issued in 1981, just after the second oil crisis. Since then people forgot to think about it for long time and power plants were built to sustain our wasteful habits. I was in a hotel room in Tokyo when the earthquake hit Japan. The room on the 10th floor was shaken badly, but nothing fell down, or was broken or cracked. Soon I discovered that I was a lucky one – my family is all in the west part of Japan and all my friends in Tokyo and Sendai are fine, although some of them are concerned about their family in the stricken area. My flight was delayed just 24 hours, and took off on Sunday, two days after the quake, when I returned to London. Since I left Japan, I have been thinking what I can do. Maybe right now I can donate for rescue activities, and to pray – for the souls of the victims to rest in peace and for servivors to have rest, comfort and medical care they need. I am praying for safety of people who are working at the nuclear power station, too. They are in widely sail around North Pacific and North Atlantic. 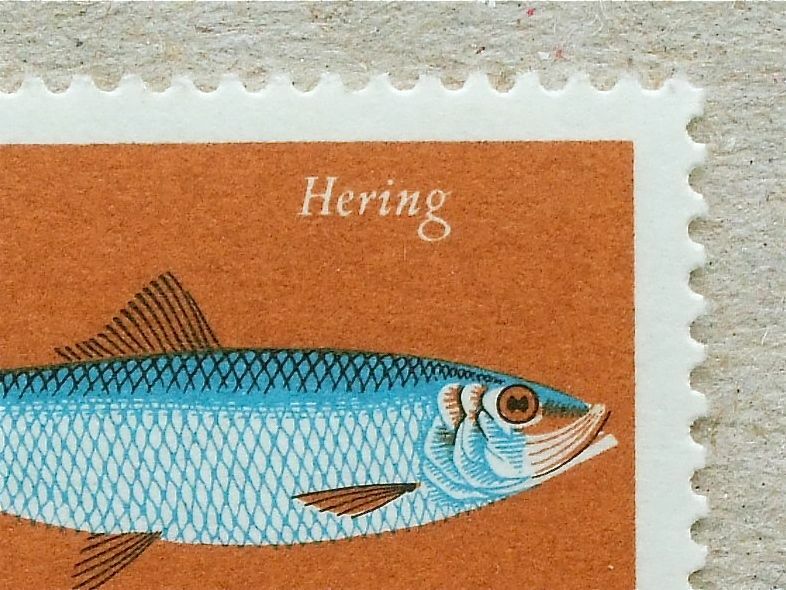 In Europe, Herring has been called the “silver of the sea”, and its trade has been so significant. Recently, as a result of their predators such as sharks, dog fish, tuna and cod have been gradually declined, the number of them are retained fine. So, let’s enjoy this oily fish, deep fried or marinated. This is my favorite offset/lithography stamp from Germany – delicate Black line on its mouth is so effective from distance view.